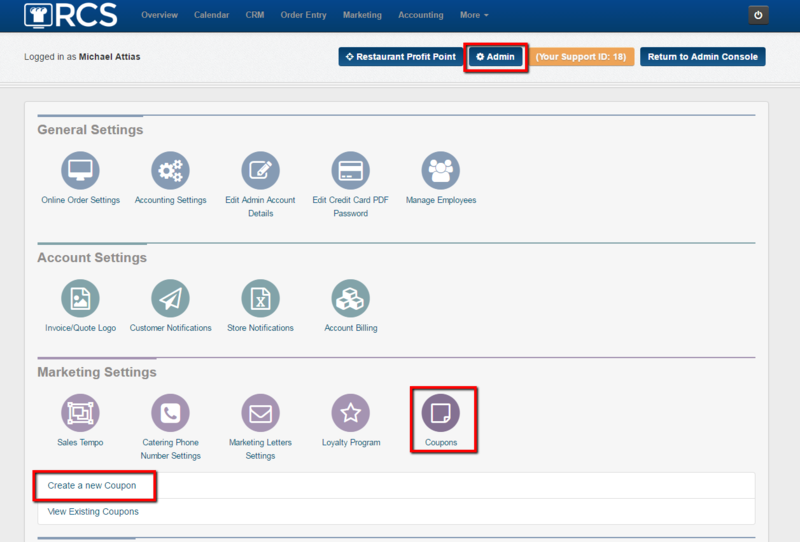 In this article we will go over all the fields that you can fill out when creating your new coupon. 1 - Click on the Admin tab, then click on the Coupons bubble and then click on the Create A New Coupon link. 2 - The next page that you will be brought to is the page that you will create the coupon on. B - Description - this is the offer that will appear in the coupon. 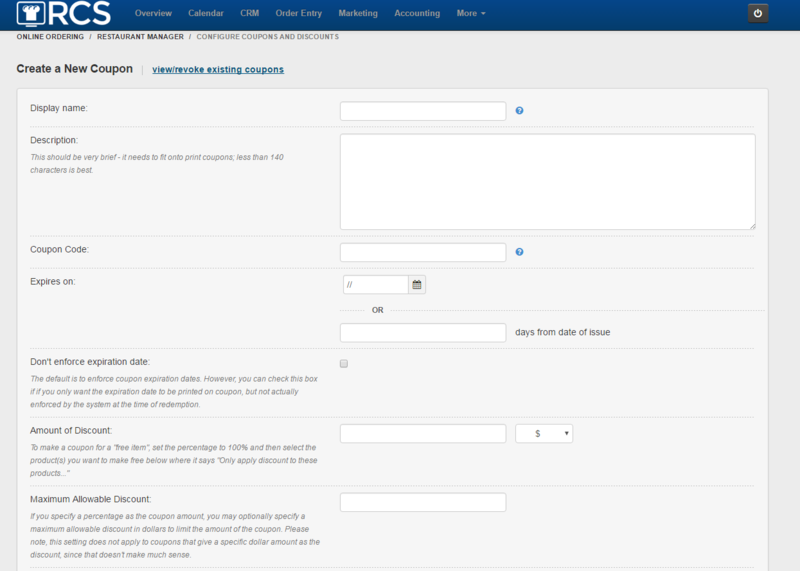 Here is where you need to include any written restrictions you want the customer to see. A - If you want the customer to have least spent a certain amount of dollars with every order they have placed you can add it here. B - If the customer needs to have spent a certain amount of money for the order they are currently placing you can add that here. 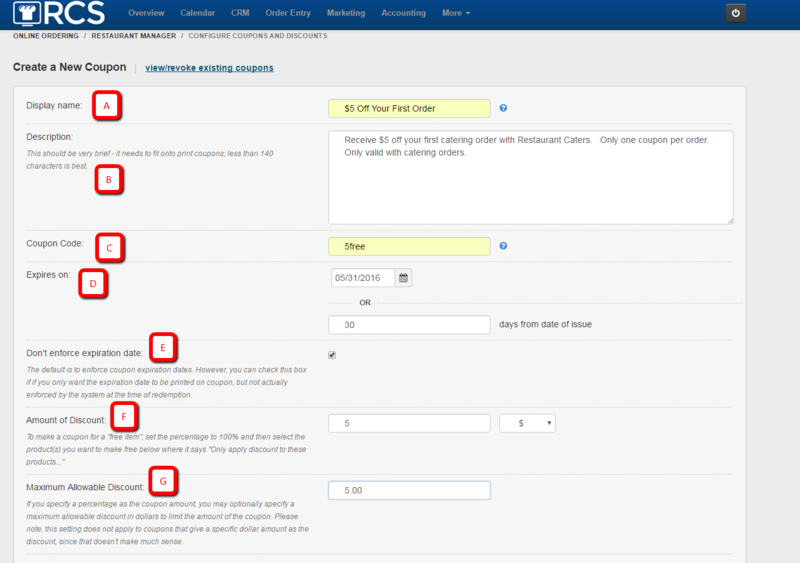 C - If the customer needs to have placed a certain number of orders for the coupon to be valid you can add that here. D - If the customer needs to have ordered within a certain time frame you can add that here. E - If the coupon is reaching out to customers who have not ordered from you in awhile you can add the number of days that have passed since their last order here. A - If the discount applies to menu item that needs to be ordered you will select that coupon in the first box that lists out the menu items. If there is more then one menu item that the customer can choose please hold down the CONTROL key and click on all menu items that apply. B - If you select a menu item in the first box of menu items listed please check off the box stating that it applies to a specific product. C - If you only want the discount to be taken off a certain number of times you will need to in put that number. 6 - The second part to the third section would be selecting a second menu item that also needs to be purchased. Once again please make sure to check off the box below to enforce the selected products in the preceding selected box. 7 - The last section will be the restrictions that you can choose to check off for the coupon you have created. A - If you want the coupon to be offered publicly to customers that qualify for the coupon will select box A. B - If you only want new customers who sign up with a referral code - select box B. C - If you want the coupon to be used only once select box C.
D - If the coupon is only for prospects that have not placed orders select box D.
E - If you want the coupon to automatically apply to orders that qualify please select box E.
F - If the coupon is only valid for orders that are paid with a credit card please check off box F.
G - Don't forget after creating your coupon please click on Save This Information tab. You have now created a coupon for your customer to apply a discount on their order.